Since the overall purpose of creating a Hyper-V cluster is to make virtual machines highly available, I will be explaining how you can deploy virtual machines to a Hyper-V cluster. Although you can use the Failover Cluster Manager snap-in or PowerShell cmdlets to make virtual machines highly available, but deploying a virtual machine to a Hyper-V cluster via VMM is easy. I have created a Hyper-V cluster by the name HVCluster. HVCluster contains two nodes named Primary and Secondary. When you right click on the Hyper-V cluster, you will see a number of actions as shown in the figure 1.0 below. These actions help you deploy a service, a virtual machine, optimizing virtualization hosts, moving cluster to another VMM host group, demoting cluster, adding another node to the existing Hyper-V cluster, validating cluster, and removing complete Hyper-V cluster from the VMM. “Create Service” and “Create Virtual Machine” actions are used to deploy a service and a virtual machine on the Hyper-V cluster. When you click on “Create Service” action, VMM opens up Service Designer to help you build the service and then deploy to the Hyper-V cluster. A Service Template contains two or more virtual machines. 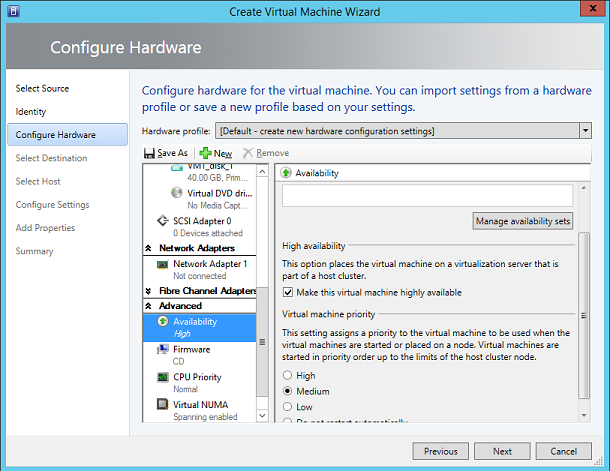 The process for deploying a virtual machine to a Hyper-V cluster is relatively simple. Let’s take a look at the steps involved in deploying a virtual machine to a Hyper-V cluster via VMM. Before you click on the Next button, you will be required to select the source for the virtual machine. You can select an existing virtual machine, a virtual machine template or a virtual hard disk as a source by selecting “Use an existing virtual machine, VM Template, or Virtual hard disk” option. 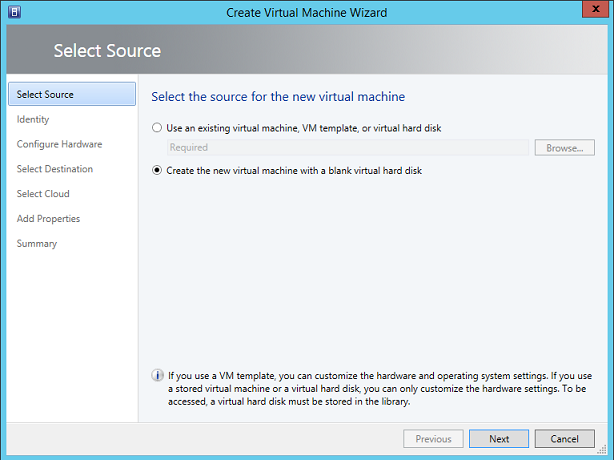 In case you wish to create a new virtual machine, you need to select “Create the new virtual machine with a blank virtual hard disk” option. In most cases, a VMM administrator will create a VM template that will be used throughout the virtual machine deployment process. A VM template contains settings such as hardware and guest OS settings. 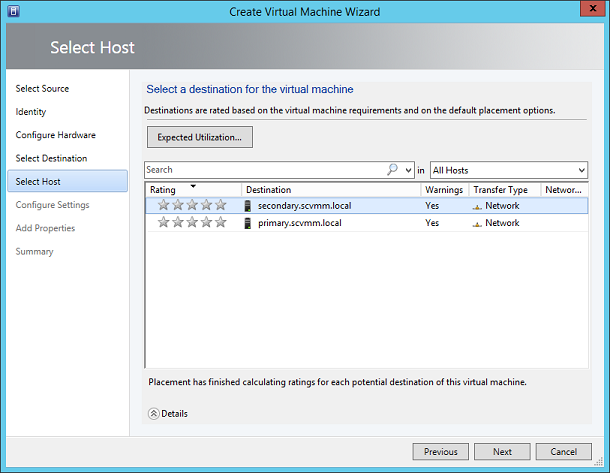 It is recommended that you create a VM template before proceeding with virtual machine creation. 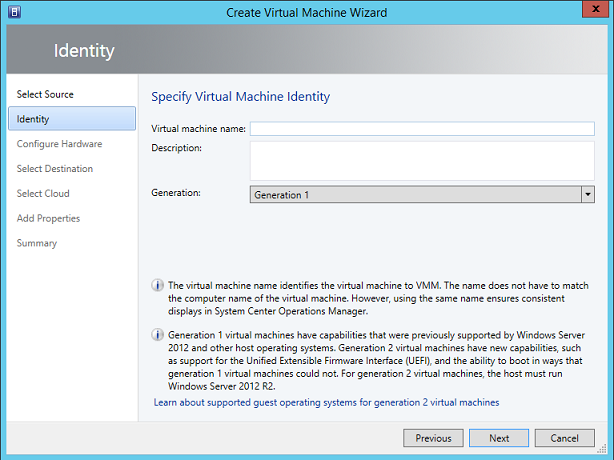 On the Identity page, you also need to select the generation of the virtual machine. Generation 1 is a legacy virtual machine and is the only option you select if you are running Windows Server 2012 and earlier Hyper-V hosts. In case you are running Windows Server 2012 R2 Hyper-V nodes in a Hyper-V cluster, select Generation 2. Generation 2 provides more features such as secure boot, relocating operating system paging file to a virtual SCSI disk, booting from SCSI disk, PXE boot by using a standard network adapter, etc. 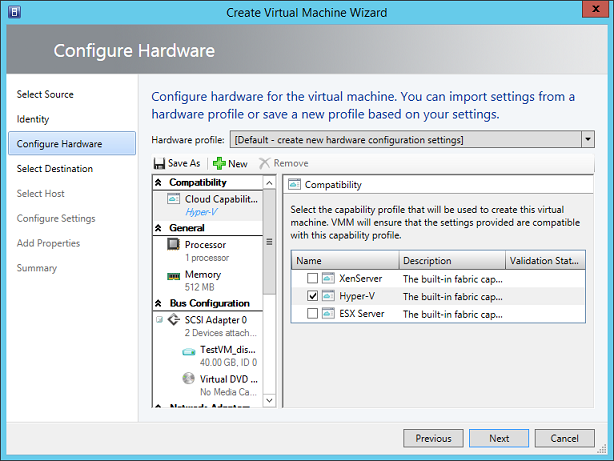 Note that in the “Configure Hardware” page, Create Virtual Machine Wizard allows you to select a hardware profile if you have already created one. It is always recommended that you create a VM template, Hardware and Guest OS Profiles using the Library pane in the VMM console before proceeding with the virtual machine creation. This will save you a lot of time in virtual machine deployments. In the “Configure Hardware” tab, specify the amount of memory, virtual processor and other details as appropriate for the virtual machine and then scroll down further to see the “Advanced” section. In the “Advanced” section, select “Make this Virtual Machine highly available” option as shown in the figure 1.4 below. In case you wish to make existing virtual machines highly available, you can do so by checking the “Make this virtual machine highly available” option on the property of an existing virtual machine. When you check the above option, this will tell Virtual Machine Manager to store selected virtual machine as a cluster resource and store the virtual machine files on the cluster storage. Next is to select the destination of the virtual machine. You can select one of three options; “Deploy the virtual machine to a private cloud”, “Place the virtual machine on a host” or “Store the virtual machine in the library” as shown in the figure 1.5 below. 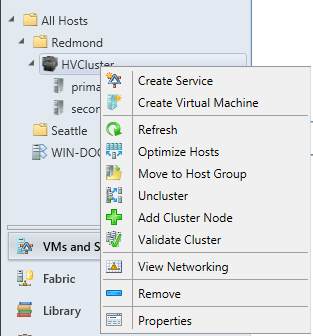 Since we are going to deploy a new virtual machine in a Hyper-V cluster, we will select the “Place the virtual machine on a host” option and then select the VMM host group where Hyper-V cluster resides. Click the Next button. When you click the Next button, VMM will invoke placement function to calculate ratings for each Hyper-V host and then display the list of Hyper-V hosts available to deploy this virtual machine as shown in the figure 1.6 below. Here you can select a Hyper-V host that is part of a Hyper-V cluster and then click “Next” button until you reach the Summary tab. On the Summary tab, click on the “Finish” button to allow VMM to create a VMM job and then start the deployment of the virtual machine to the Hyper-V cluster. 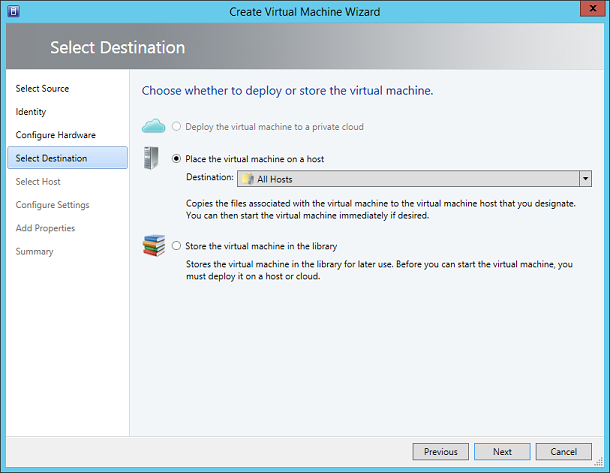 This article explained the process for deploying a virtual machine to a Hyper-V cluster via VMM. We also explained how you can make an existing virtual machine highly available by selecting “Make this virtual machine highly available” option. In the final part of this article series, we will explain how to deploy virtual machines to a Hyper-V cluster by using the Failover Cluster Manager and PowerShell cmdlets.